Plans to bring live music at the Hub have been revitalized in the form of Canarchy. The weekly series, kicking off on Feb. 12, will showcase a live rock band every Thursday. “I think a campus bar [ . . . ] should have live music. It’s a part of the event,” explained Whyte to the Manitoban. Inspired by American college parties and the popular AMC drama Sons of Anarchy, the weekly series will showcase a plethora of modern-day drinking trends. Whyte cited the return of “dad beers” such as Old Milwaukee and Pabst Blue Ribbon as well as “the old boilermaker” (a shot of whiskey and can of beer) as making Canarchy another great excuse to enjoy a beverage on a Thursday. “So bikers, whiskey, beer, rock ‘n’ roll [ . . . ] and I thought, ‘okay so we’re going to call this night Canarchy,” said Whyte. While “Canarchy” on first glance seems like a purely classic rock event, there will be a variety spanning the rock spectrum: On March 26 the soul-folk group, the JD Edwards Band will be featured and on April 9 the Kasabian-inspired band Attica Riots will take the stage at the U of M bar. “I am trying to convince myself that not everybody under [the age of] 25 is listening to electronic dance music. There has to be some people out there that love rock ‘n’ roll,” Whyte told the Manitoban. Brandon Whyte is the new manager of the Hub, bringing 25 years of experience to the job. Whyte is passionate about the potential that the Hub has to offer. 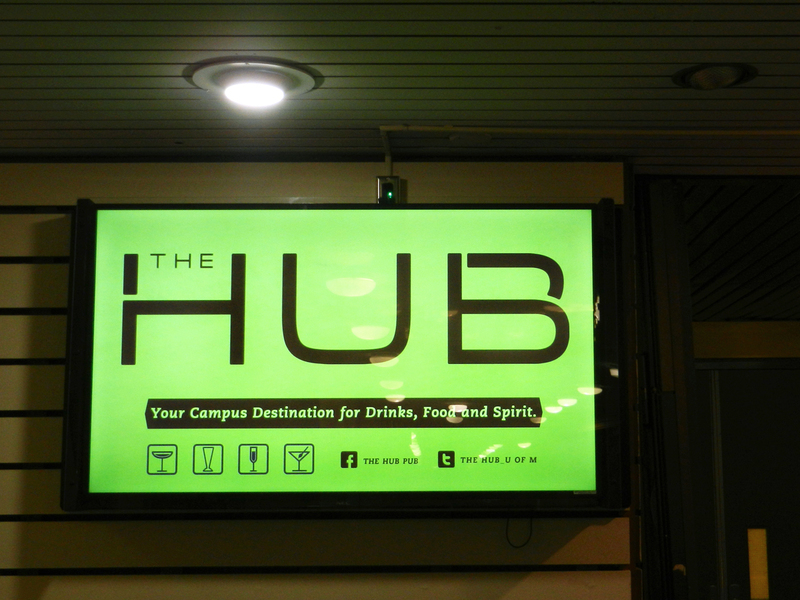 “I would like to see the Hub get a little bit ‘warmer’ and turn more into a pub,” said Whyte. Whyte was born and raised in Winnipeg and one of his first jobs was as a bus boy for Bailey’s. His experience in bars led him to running bars on Edmonton’s Whyte Avenue (no relation) as well as bars on the University of Alberta campus. His experience includes working as a radio rock DJ on community and commercial radio stations, backed up by his larger-than-life-sounding voice. This talent allows the manager to easily run up on stage to arouse the crowd for events such as Jets games at the pub. As the Hub manager, Whyte takes pride in his ability to be a part of students’ memories at their campus bar. “I fell in love with the industry; I fell in love with taking care of people,” said Whyte. The Hub is located on the third floor of University Centre at the U of M Fort Garry campus. The pub is one of many services owned by UMSU, includinging Degrees Restaurant and Archives Used Bookstore. As a service of UMSU, the Hub has a mandate to provide a service for all students within the union. The bar is often used to host different socials and gatherings put on by different faculty associations and clubs on campus. “I love that idea that the Hub is going to be something different for every association, group, or faculty [ . . . ] on campus. They can make it that whatever they want for the night,” said Whyte. The Hub offers specials for each night of the week. Monday is Comedy Night, where both old pros and up-and-comers test their jokes in front of a student demographic. On Tuesdays, the pub features karaoke and on Wednesdays, the notorious Rez Nightpresents both residence and day students at the U of M with $2 beers.